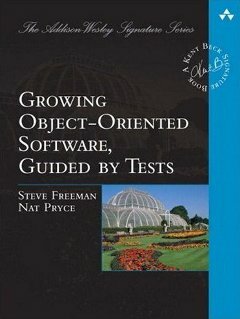 "Testing towards A Specification: A Systematic Approach"
It is based on Test Driven Development with Mock Objects, hence the focus is on interaction-based testing. I'm introducing the mocking framework CalitkoMocks, which is specially designed to provide a notation for writing tests that can be mapped one-to-one to sequence diagrams. Sequence diagrams are classically used to specify object-oriented software systems, however, it is obvious that just a bunch of diagrams representing individual cases cannot really be regarded as a specification. To address this point, I'm also presenting a few test refactorings which help to extract test scenarios (i.e. generalized test cases), which are more suitable to use as a specification. After I drew the diagram corresponding to my test, I decided to try to write a test corresponding one-to-one to the sequence diagram. The sequence diagram showed the calls to my stub objects but my test didn’t (because the implementation invoked them implicitly). I ended up writing smarter versions of my stubs which eventually evolved into mocks. Though I had already read about mocks at that time, I didn’t quite get it what kind of beasts these were. It was only after I reinvented the mock that I truly understood the concept. Perhaps this is a step on the way to addressing Jason Gorman's concerns. We have a couple of sessions at XpDay London. Steve will be giving our Synaesthesia talk on Monday. On Tuesday, Nat, with Romily Cocking, Andy Pols, and Steve (part-time) will be giving an introductory tutorial on TDD with Mocks. Book soon! Yesterday I visited a team at a Cyrus Innovation site. They came up with this example. If you can't read it, the writing on the ball says "Throwable". Cute. On a side note, this blog is "powered by Blogger" and I keep getting bits of the UI text in German. Does anyone have any idea what's happening?